Preheat oven to 350F. Using cooking spray, grease and flour 3 (9-inch) cake pans and set aside. In a large bowl, sift together the flour, cocoa, baking soda, baking powder, and salt and set aside. In a smaller bowl, stir together the milk and malted milk powder and set aside. In the bowl of a stand mixer, beat the oil and sugar on medium speed. Add the milk and malted milk powder mixture, oil, eggs, vanilla and sour cream to the bowl and beat at medium speed until combined. Then, on low speed, beat in the sifted dry ingredients until just combined. Pour the batter evenly into the 3 prepared pans and bake in the centre of the oven until a toothpick inserted into the centre comes out clean or, preferably, with just a few crumbs attached to it, about 14 to 18 minutes. Place the pans on a wire rack until cool enough to handle. Then remove the cake from the pans and allow them to cool completely on the wire rack. Meanwhile, make the frosting. Once your cake layers have cooled completely, use a large and sharp knife to trim off the rounded tops, so that you have flat surfaces. In a small bowl, mix together the cream and malted milk powder and set aside. In a bowl of a stand mixer fitted with the paddle attachment, combine the icing sugar and butter and beat on low speed for about 1 minute. Add the vanilla and cream with malted milk powder. Beat on medium-high speed until well combined, about 1 minute. Then add the melted chocolate and beat on medium speed until very smooth (about 2 minutes). If the frosting is not chocolatey enough or if it is not stiff enough for your taste, add cocoa powder 1 tbsp at a time and beat on medium-high speed until very well combined. This frosting is best if used right away, so I’d recommend using a different frosting recipe if you need to make the frosting in advance. I use a large, offset, metal spatula to spread frosting onto a cake. Spread a bit of frosting onto the centre of your cake board. This will prevent your cake from sliding off. Then centre your bottom layer of cake on the cake board. Spread a layer of frosting on top of your cake, leaving a thin edge of unfrosted cake all the way around. Then place your middle layer of cake ontop of the bottom layer and very gently press down on it. Add a layer of frosting on top of the middle layer, again leaving a thin edge of unfrosted cake all the way around. Then add the top layer, press down very gently, and frost the top and sides of the cake as desired. Finally, garnish with malted milk balls as desired (personally, I think the more malted milk balls you use, the better). 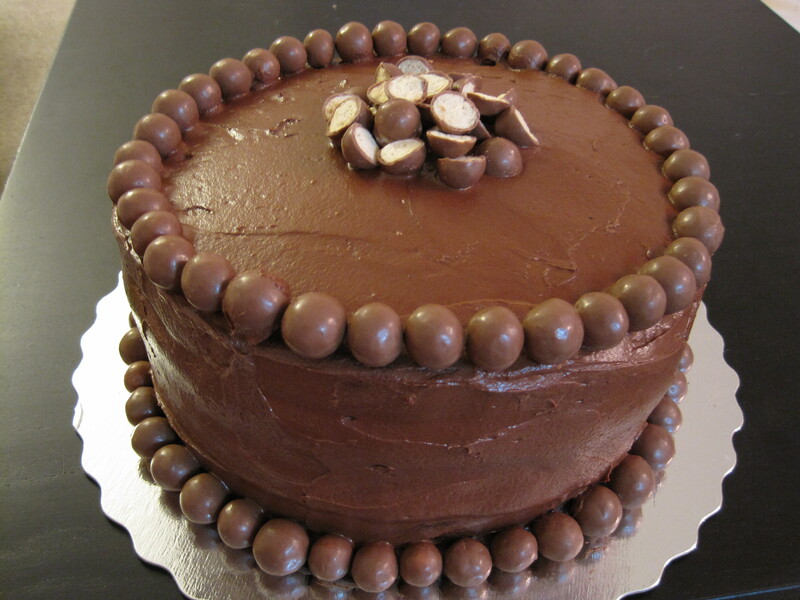 This cake is best enjoyed the same day it is made, because the malted milk balls will become soggy as they absorb moisture from the air. Alison, that’s a great looking cake. My whole family adore horlicks. I like the very apt addition of maltesers :D. I’d adore to have a slice of that.The cakes I make clearly are never indulgent enough. Thank you for your comment! It’s so nice to hear that other people love Horlicks too! Growing up, most of my friends had never even heard of it! This looks absolutely delicious, and seems quite similiar to a Nigella cake recipe I sometimes make. I like the added tang of the horlicks. Thank you so much for your comment! Nigella makes Beautiful cakes! Yes! Bring back the malty love! Ovaltine is still my warm drink of choice… but only because Horlicks discontinued their chocolate flavour. : ) This looks delicious! What a wonderful recipe! I love chocolate cake and yours looks amazing. That is very kind of you to say. Thank you! I hope you make it too! I am thinking of making cake donuts from this recipe – any thoughts ? That sounds like a delicious and creative idea!!! Please let me know if it works out for you! I think this just might work 🙂 Good luck!